The U.S. is currently in the midst of a natural gas boom, with production growing dramatically in recent years. The resulting glut of natural gas has led to a decline in prices which has, in turn, prompted increased gas use in electricity generation and other applications. Many see this as a positive development because the combustion of natural gas results in fewer climate-damaging greenhouse gas emissions than coal and oil (per unit of energy produced). Others, however, have expressed concern about emission during natural gas production. Recent studies indicate that natural gas production emits significant methane, which is a highly potent greenhouse gas, with approximately eighty-four times the climate impacts of carbon dioxide (on a pound-for-pound basis, over a twenty-year time horizon). Achieving long-term climate change goals may, therefore, require the phasing out of natural gas use. A new Sabin Center working paper, published online today, explores how technology can be used to promote more efficient natural gas use. 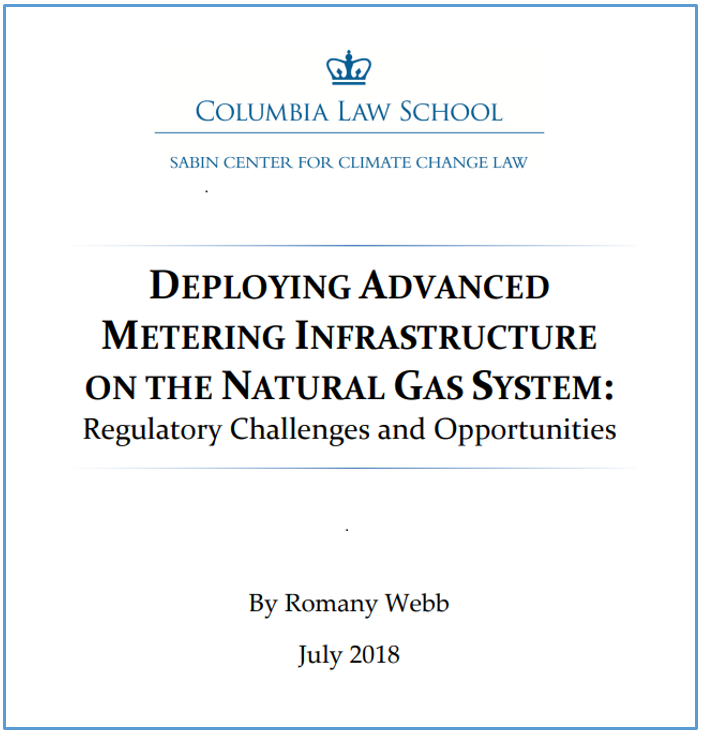 The focus is on advanced metering infrastructure (AMI), consisting of state-of-the-art gas meters capable of recording natural gas use hourly or daily, and transmitting the data to customers in real-time via a wireless network. This is likely to encourage customers to conserve natural gas, with research suggesting that residential and commercial gas use could decline by up to four percent, leading to a reduction in greenhouse gas emissions. Further emissions reductions may also occur due to improved management of the natural gas pipeline system. For example, the wireless communication networks deployed with AMI can be used to collect data from methane and other pipeline sensors, enabling natural gas leaks to be detected and repaired more quickly. adopting a performance incentive scheme that rewards LDCs for investment in AMI by, for example, allowing them to retain a share of the cost savings generated through use of the technology. Implementing these recommendations would help to accelerate the deployment of AMI, potentially leading to a reduction in natural gas use and associated greenhouse gas emissions. Thanks you all. Nice Article!